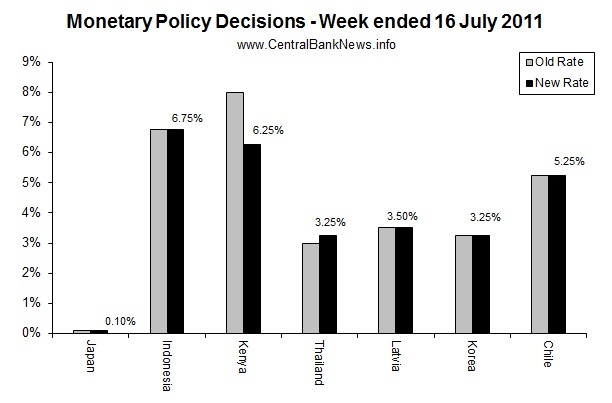 The past week in monetary policy was dominated by Asian central banks, with the central banks of Japan, Indonesia, Thailand, and South Korea all announcing interest rate decisions. The only banks to adjust interest rates were Thailand +25bps to 3.25%, and Kenya, which dropped its discount window rate -175bps to 6.25%. Meanwhile those that held interest rates unchanged were: Japan 0.10%, Indonesia 6.75%, Latvia 3.50%, South Korea 3.25%, and Chile 5.25%. Elsewhere in monetary policy and central banking, Brazil‘s central bank announced further policy measures to curb speculation on its currency, the Real. While inflation remained a threat for most of the central banks who reviewed monetary policy settings during the week, for many the focus was squarely on the downside risks to both domestic and global growth. Indeed a couple of the banks pointed specifically to the tail risks in the form of the European sovereign debt crisis. For those that held rates unchanged, for the most part the messaging was positive, with some viewing inflationary pressures as somewhat contained, while many presented a positive outlook on their domestic economy. Source: Central Bank News, July 16, 2011. Spanners in the works. Our reasonably constructive outlook for the global economy in 2H11 is being seriously challenged by two recent events – the surprisingly weak US labour market report and the spreading of the euro area debt crisis to Italy, the third-largest government bond market in the world. While the lack of labour market improvement in recent months throws doubt on the expected rebound in US economic activity this and next quarter, the worsening debt crisis could make even our below-consensus forecast for European growth in 2H11 and 2012 look wildly optimistic. US markdown. To be clear, we continue to look for a rebound in US growth during 2H11, driven by a rebound in auto production, relief for the consumer from lower gasoline prices, stronger capex due to tax incentives and US re-industrialization, and support from net exports. However, several of these factors are technical or temporary by nature, and the apparent lack of labour support in recent months has induced our US team to mark down its GDP growth forecast for 2H11 to 3.5% from nearly 4% last month. Fiscal policy uncertainty. Moreover, uncertainty about the 2012 US outlook remains very high as much will depend on the course of fiscal policy, where there is a wide range of possible outcomes at this stage. On current policies, the expiration of tax relief for companies and households would lead to a significant automatic tightening of fiscal policy early next year. Yet, the recent weak economic performance might help build momentum for other measures aimed at boosting employment and an extension of the current tax relief, probably coupled with a last-minute compromise on the debt ceiling. Below consensus, but still too optimistic? In Europe, our base case has already been a significant slowing of the euro area economy in 2H11 and 2012, reflecting slower global trade momentum, past euro appreciation, a less supportive ECB and peripheral fiscal tightening. Note that this scenario was based on the assumption that governments would succeed in kicking the proverbial can further down the road, thus containing, though not resolving, the sovereign debt crisis. Too large to rescue. However, the recent spreading of the debt crisis to Italy, the euro area’s third-largest economy and the third-largest government bond market in the world, has significantly increased the stakes for policy-makers. Italy is not too large to fail, but in our view, it is too large to rescue, if this ever became necessary. We expect a combination of Italian fiscal austerity measures to be finalised soon and additional euro area-wide measures such as an agreement on a second Greek rescue package and an increase in the scope and flexibility of the EFSF, possibly coupled with a reopening of the ECB’s bond purchase programme, to help contain the crisis. We are mindful, however, of the high and rising risk that severe policy divisions between and within the euro area governments prevent agreement on such stop-gap measures, which would raise the spectre of a much larger crisis, recession and, potentially, a break-up of the euro. ECB may change its tune. Meanwhile, the ECB Council continued to sound hawkish and prepared to raise rates at least once more in the statement and press conference accompanying last week’s rate hike. However, with the debt crisis intensifying since then, implying a market-based tightening of monetary conditions for a large part of the euro area including Italy, further rate hikes look less likely now than they did a week ago. Much of the rate outlook will depend on whether governments manage to come up with a stop-gap as discussed above. EM: From tightening to easing? Moreover, uncertainty about growth and sovereign debt in the DM world is also likely to make EM central banks reconsider their policy stance faster. Even before the recent events, our view has been that policy tightening in the EM world is coming to an end as inflation looks likely to have peaked for now and the soft landing in China seems to be at hand. A more uncertain growth outlook for the US and Europe is likely to accelerate this process and may even lead to a faster swing from tightening to easing in China as policy-makers are keen to protect growth. Liquidity cycle alive and kicking. Against this backdrop, global monetary conditions are likely to stay easy for longer, with real policy rates remaining in negative territory in many countries. As a consequence, the global liquidity cycle is likely to remain alive and kicking, and the recent dip in our preferred measure of excess liquidity – global money supply M1 relative to nominal GDP – should prove to be temporary. ‘Nominal’ rather than ‘real’ solutions. Taking a step back, the recent events and likely policy responses lend support to our view that the developed world is heading for a ‘nominal’ rather than a ‘real’ solution to its problems. Governments’ apparent inability to come to grips with the long-run fiscal policy issues in Europe and the US, together with the uncertainties surrounding the growth outlook, are forcing central banks to keep the spigots open for longer. This makes an inflationary global outcome in the next several years more and more likely. However, a good dose of inflation may be exactly what the doctor ordered for a highly indebted developed world. As the 1930s and Japan have taught us, the opposite would be much worse in many respects. Source: Joachim Fels, Morgan Stanley, July 15, 2011. The June JP Morgan Global Composite PMI, which takes both the manufacturing and non-manufacturing/services into account, dropped to 52.2 from 52.6 in May (a number above 50 indicates expansion). The slowdown in growth was broad based, with weakness particularly evident in countries in the Eurozone with France leading the way as the country’s Markit composite PMI fell 5.4 points to 54.9 in June from a robust 60.3 in May. Germany’s Markit composite PMI was reasonably resilient, contracting by 0.8 points. The Eurozone’s composite PMI fell to 53.2 from 55.2, with the manufacturing PMI down 2.6 points to 52.0 and the services PMI down 1.7 points to 53.7. The situation in the Eurozone’s debt-ridden countries is worsening, though. The contraction in Japan continues to ease, with the Markit composite PMI jumping to 47.6 from 46.2 in May. Growth in the U.S. eased slightly, with my ISM GDP-weighted composite PMI registering 53.8 from 54.3 in May. The manufacturing and non-manufacturing PMIs again reversed roles, with the non-manufacturing PMI falling to 53.3 from 54.6 while the manufacturing PMI rose to 55.3 from 53.5. My composite PMI for China slumped from 57.9 in May to 54.6 mainly due to seasonal factors as on a seasonally adjusted basis the PMI dropped slightly to 54.6 from 57.9. Elsewhere the composite PMIs for Brazil and Hong Kong retreated rapidly. Growth in the global manufacturing sector eased slightly, with my GDP-weighted manufacturing PMI for the major economies dropping marginally to 52.8 from 31.1 in May. The turnaround in the U.S.’s manufacturing sector from 53.5 to 55.3 prevented the gauge from dropping severely drop, though. Although growth in the Eurozone’s manufacturing sector is continuing, it has softened considerably. Germany’s PMI came in 3.1 points lower following its drop of 4.3 in May. The Eurozone followed its 3.4 index point decline in May by a further drop of 2.6 points to 52.0. The decline in China’s CFLP manufacturing PMI of 1.1 points was in line with my earlier expectations based on seasonal weakness, while on a seasonal basis growth improved marginally. Australia’s manufacturing sector experienced a significant turnaround, with the PMI reversing from a contracting 47.7 to an expanding 52.9. Turkey was the only other country experiencing faster growth in its manufacturing sector. The past week in monetary policy saw interest rate decisions from 14 central banks around the world, of which 7 made changes in their monetary policy settings. Those that increased interest rates were: Sweden +25bps to 2.00%, China +25bps to 6.56%, the EU +25bps to 1.50%, and Denmark +25bps to 1.55%. While those that cut rates included Vietnam, which cut its OMO rate -100bps to 14.00%, and Ghana -50bps to 12.50%. Those that held rates unchanged were: Australia 4.75%, Poland 4.50%, Malaysia 3.00%, the UK 0.50%, Sri Lanka 7.00%, Rwanda 6.00%, and Mexico 4.50%. Also, setting monetary policy interest rates for the first time was the Bank of Uganda, which set its new monetary policy rate, the central bank rate, at 13.00%. One of the themes that stood out was additional monetary policy tightening, or more appropriately – monetary policy normalization, from developed market central banks e.g. Sweden, the ECB, and Denmark. Meanwhile the actions of Vietnam and Ghana show that it’s not a one-way street for emerging markets. However the inflation-growth mix still remains a challenge for some key emerging markets, as made clear with China’s additional interest rate hike. But while some noted upside risks to inflation, many banks are seeing inflation tracking within their target ranges. Bank of Ghana (reduced interest rate 25bps to 12.50%): “Inflation is going down and we don’t see the banks responding (to lower interest rates)” and further noted that “the bank is confident that the annual inflation target of 9 percent is achievable”. Source: Central Bank News, July 8, 2011.